Of all the goaltenders who have played for the New York Rangers in their 90-year history, six are members of the Hockey Hall of Fame, two are in the United States Hockey Hall of Fame, and one, Henrik Lundqvist, is well on his way to hockey immortality. However, only four ever backstopped a Stanley Cup championship for the Rangers. Can you name those four goaltenders? Keep reading, you’ll find the tricky answer listed below. Here’s a breakdown of the three best goaltenders in franchise history, as well as a look at a host of other notables. Not only is Henrik Lundqvist the top goaltender in the history of the Rangers, but he just may be the greatest Ranger ever. Period. At the very worst, Lundqvist is in the conversation along with Brian Leetch, Rod Gilbert, Andy Bathgate, Mark Messier, and Frank Boucher. Nonetheless, when it comes to goalies and this franchise, Henrik is, well, The King. He owns every important Rangers goaltending record and for 13 years now has been the backbone of the Blueshirts renaissance, a team that has made the playoffs in all but two of his seasons on Broadway. In 2017 he became only the 12th goalie in the National Hockey League to win 400 games; and earlier that season he passed his idol, Dominik Hasek, as the winningest European-born goaltender in league history. Having witnessed his incredible drive, work ethic, and desire for perfection first-hand, it is easy to put him at the top of this list. Of course, Lundqvist has not won a Stanley Cup yet. Considering his magnificent post-season work, including his top-shelf play during the 2014 Cup Final against Los Angeles, though, Lundqvist remains the choice as the greatest goaltender in franchise history. The people’s choice because he was the terrific last line of defense on the Rangers only Stanley Cup-winning team in the past 76 years, Mike Richter ranks a respectable one spot behind Henrik Lundqvist. Like Lundqvist, Richter was an incredibly intense competitor; and perhaps that was his greatest asset as a successful National Hockey League goalie. He also was freakishly flexible, a trait that certainly is embedded in Rangers lore with his memorable split-save to deny Pavel Bure on a penalty shot during the 1994 Stanley Cup Final. Without Richter, not only do the Rangers fail to win the Cup in ’94, they do not beat the New Jersey Devils in that year’s Eastern Conference Final. It was Richter who almost-singlehandedly saved the season with his superb performance in Game 6 of the ECF before Mark Messier cemented his “guarantee” with a third-period hat trick. And it was Richter, again, who outdueled Martin Brodeur in the epic double-overtime of Game Seven that year, setting the stage for Matteau! Matteau! Matteau! As crazy as it may sound, his best body of work may actually have come during the 1997 playoffs when the Rangers rode Richter all the way to a stunning appearance in the Eastern Conference Final. A great New York Ranger, whose impressive career numbers of 301 wins and 666 appearances would have been better if not for groin, knee and head injuries late in his career, Mike Richter is No. 2 on the list of top Blueshirt netminders. In another era of the National Hockey League, the 1960’s and ’70’s, Ed Giacomin was the best goalie of his day never to win the Stanley Cup. That is something Giacomin and Lundqvist hold in common. And like Richter, Giacomin was a smaller goalie with great reflexes and a fearless bent to his game. Giacomin was the first goalie to have his jersey retired by the Rangers. His No. 1 hangs in the rafters at Madison Square Garden along with Richter’s No. 35, one day to be joined by Lundqvist’s No. 30. He is still beloved by the Blueshirts Faithful; and if you listen closely, you can still hear the “Eddie! Eddie!” chants bounce off the walls at MSG for the Hockey Hall of Famer and 1970-71 Vezina Trophy winner. Etched in the memory banks is Nov. 2, 1975, the night Giacomin returned to The Garden after being claimed off waivers by the Detroit Red Wings two days earlier. New Yorkers shared their love for Eddie that night and cheered the visitors to victory. Giacomin is still second in franchise history with 49 shutouts and third with 266 victories; and rounds out this Top 3 list of top Rangers goaltenders. He sometimes gets overlooked because Richter’s rise in the organization led to his own departure, but John Vanbiesbrouck was a very good Rangers goalie for nine years. The Beezer won the Vezina Trophy in 1985-86, gained election to the U.S. Hockey Hall of Fame, one year ahead of Richter, in 2007, and won 200 games wearing the Blueshirt, fifth most in franchise history. 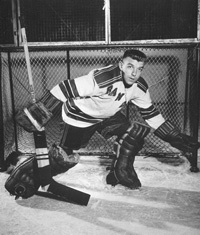 Gump Worsley is a Hockey Hall-of-Famer, who won 204 games for some very bad Rangers teams overten seasons during the 1950’s and ’60’s. He was a workhorse in goal, and a real personality, both on and off the ice. Interestingly, he and Richter both had 24 career regular season shutouts with the Rangers. Dave Kerr posted 40 shutouts over 324 appearances wearing the Blueshirt over seven seasons in the 1930’s and ’40’s. His biggest claim to fame? Kerr was the last goalie not named Mike Richter to win a Stanley Cup with the New York Rangers, doing so in 1940. Though he was largely a second-string goalie, and thus ended up with only 98 career victories, Gilles Villemure deserves a mention on this list. Villemure teamed with Giacomin for most of his career, creating the best goaltending tandem of their day in the NHL. Four times in his career, Villemure won 20 games, and in 1971-72 he posted a 2.09 GAA in 37 appearances. The year before, he shared the Vezina with Giacomin. OK, so you already have half the answer by now. Mike Richter and Dave Kerr are the two most recent No. 1 goalies to have led the Rangers to Stanley Cup championships. Lorne Chabot in 1927-28 and Andy Aitkenhead in 1932-33. However, this is somewhat of a trick question. In an interesting historical side note, Lester Patrick, the Rangers legendary coach and general manager, actually replaced the injured Chabot in Game 2 of the 1928 Cup Final. The team picked up goaltender Joe Miller from the New York Americans to start the remaining three games of the series; and it was Miller who actually was between the pipes when the Rangers won their first championship, though Chabot is still viewed as the team’s top goaltender that season.